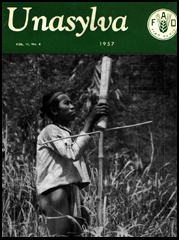 PREPARED by the Forestry Division and published every quarter in English, French and Spanish, by the Information Division at FAO's Headquarters in Rome, Unasylva attempts to cover a range of interest as wide as that of FAO's Forestry Division whose work it mirrors. Signed articles express the opinions of the authors and do not necessarily represent the views of the Organization. All material in Unasylva may be freely reprinted, but acknowledgement is requested, together with a copy of the publication containing the reprint. Annual subscription: U.S. $2.50 or 12s. 6d. Single copy: 65 cents or 3s. 3d. Rates can be paid in local currencies when orders are placed through the authorized sales agents listed on the back cover. Orders from countries where sales agents have not yet been appointed, should be sent to: Distribution and Sales Section, Food and Agriculture Organization of the United Nations, Viale delle Terme di Caracalla, Rome, Italy. 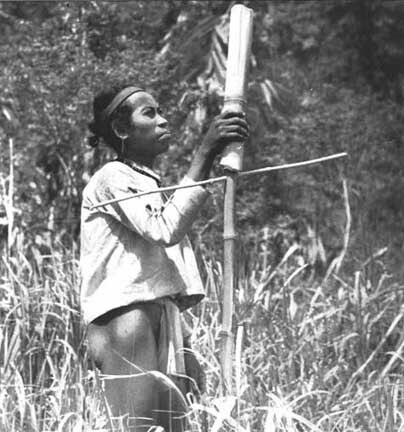 Cover Photograph: On Mindoro Island, in the Philippines, a Hanunóo shifting cultivator is required to leave a "detour marker" when a clearing is made across an established trail. Inscribed on the outer surface of the bamboo cylinder in this photograph is a message written in the Hanunóo, syllabary telling the traveler where he should walk to avoid an area recently cut over - but still unburned - for purposes of shifting cultivation.